In this review, I am going to introduce you to TOP 5 INNOVA pioneer scanners in the market. INNOVA Electronics Corporation is one of the front runners in producing Auto Scanners, famous for their precision and resilience. INNOVA products are all circulated directly from their offices in U.S. & Canada. The research and innovative design of INNOVA products are carried out from their Headquarters in California incorporating the highest technology at hand. With 15 years of work experience the ASE skilled repair technicians at INNOVA have compiled a thorough database of more than 3 million repair diagnosis for nearly all kinds of cars and light trucks. This team of certified technicians is available to help customers on how to install and make the most use of their sophisticated devices. INNOVA’s appreciation of the importance of environment has focused their research on enhancing engine emission readings and diagnosis by their OBD2 scanners. I must add that INNOVA has built trust by providing 1 year warranty for all its products. INNOVA 3100 in recent years has justly earned first rank rating among OBD2 scanners for its fast, easy to use and wide range of technical benefits. It is the favorite among Do-It-Yourself drivers. You would know why the Engine and the ABS lights are on. You would know if your car will pass the emission test. You would know your engine diagnostic readings with all the definitions beside them. Finally you can turn off the engine light and clear all the readings. Sold with a useful booklet describing how it works in an easy way. This includes a code chart covering most kind of cars. Simple 3 color test result display of the engine. Readings are refreshed every 30 seconds, guaranteeing the repairs carried out. The menu is simple and easy to read and work with. All the data is displayed by a single press of a Hot Key button. With independent battery supply you have the chance to analyze your readings off the car. There is a hitch when resetting the “check engine” code; it erases the memory so you must print the reading on your PC first. It can’t read some useful OBD data like engine temperature. In case of INNOVA 3160 the feature which has attracted so many customers is its simplicity. Having a large monochrome display, all the data readings are displayed on one screen without needing to scroll up or down. Diagnosing Engine Light of all cars manufactured from 1996, including small trucks and minivans made inland or abroad. Ability to read ABS and SRS data. Providing improved Live Data SAE readings. Shows OBD2 Snapshot data and turns off the check engine light. Updatable in a blink of an eye by connecting to the PC. The package includes OBD2 and USB cables. A quick reference guide in 3 languages is provided. A new blue backlit screen gives you the opportunity to see 25 data readings in English, Spanish and French languages without needing to change screens. Enhanced live data reading complete with charts and playback data, making the analysis faster and easier. This scanner does not work on older OBD1 cars. The emission test is particularly assigned for U.S and Canadian standards and probably won’t match in other countries. The INNOVA 3130C Diagnostic Scan Tool is a go-to device for live data car readings and a comprehensive scanner with an updated database of solutions to common automotive errors. Alongside scanning your car engine, 3130 allows you to freeze live data readings to find out where the problem exactly is. It has the ability to save data readings even when it is not connected to the engine. You can easily connect it to your PC for storing, printing and most important of all for updating. Three language reading and definitions. On purchase OBD2-PC link, Connecting cables, holding case and the User’s Manual are provided. It weighs only 3 pounds making it handy to take around and work with. Easy to connect and run. Awesome backlight LCD screen screen . In comparison to other scanners with the same features it is by far the cheaper one to buy. Does not carry out particular O2 tests, although displays the status of O2 sensors. There is no setting option to adjust the display- you can just view it. The Innova 3040c is a versatile, capable scan tool for the DIY user, covering most aspects that you’ll ever need without the necessity of a Bluetooth-capable device connected to it. Reads engine caution lights for all cars built from 1996 including light trucks and minivans. Reads live date and you have the option of freeze data analysis. It is programmed to refresh readings every 30 seconds. With a USB connection you can update your scanner making sure of a longer life span. Three language display – English, French and Spanish. Handy and easy to use scanner for new technicians and keen Do-it-Yourself drivers. Considering the low price, the technical features packed in it, surely outweigh the money spent for it. The connecting USB cables are provided with the scanner. Ability to read Live Data. A big plus with a scanner of this price range. Some customers have complained about the grey back-lit LCD screen with blue text. A more crystal display would have been much more attractive. 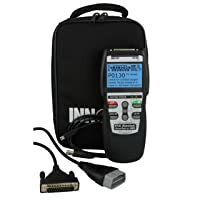 The Innova 3150 Diagnostic Code Reader is a scan tool for checking SRS and ABS codes on cars that have been manufactured since 1996. It’s a device that would benefit both automotive technicians and regular users. 3150 scanner can read both general data (PO, P2, or UO) and particular producers codes (P1, P3, and U1). The Battery backup system gives you the option to operate the scanner when the engine is off. Capable of refreshing itself every half a minute allowing you to follow the result of the repair job done. The display is presented in a way that you don’t need to scroll up and down to find the readings you want; most of the important data are shown on your homepage. Your scanner will have a longer life span because of the warranty and active technical support provided by the INNOVA team. Unlike its competitors this scanner is adaptable to aged OBD1 vehicles too. On purchase the tool package will contain the battery support system, 3 connecting cables, CD for software connection and a handy User Manual. Some customers have reported inconsistencies in data readings by this tool. Surely the nature of these variations should be checked technically. First: INNOVA products are manufactured to suit the exact needs of the target customer, either a professional technician or an average car owner who wants to take matters in his or her hands. Second: INNOVA products are exceptionally user- friendly. Third: They have a good reputation of being tough products with long life span. On this platform I recommend you search for your specific needs and choose one of the 5 best INNOVA products reviewed.